Our personalized PHOTO INSERT Mint Tin is a beautiful and unique way to remind your guests of the great time they had at your graduation party! Personalized Mint Tins make a great keepsake long after your Graduation Party is over! 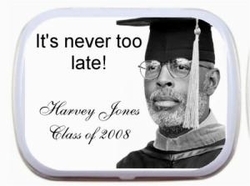 This "It's Never Too Late" photo designed Mint Tin is one of our most popular tins. Just send your photo and order number (once you place your order) to PHOTO DROP ORDER and we will replace the photo on the front with yours! The left side of tin will be personalized as you choose. Each Personalized Mint Tin is designed with a hinged closure, topped with a personalized label and individually shrink wrapped around the edges of each tin. Each palm sized mint tin measures 2.25" x 1.75" x .5" (but are also available in the Altoid mint tin size which is 3.75" x 2.5" x .75"). Price - $2.50 each for the small tins $3.50 each for the large Altoid tins.